To make the raspberry puree, blend thawed raspberries in a blender and push it through a sieve. DIscard the pulp. First juice your grapefruits and gather the juice in a bowl or a glass. Add the vodka and rosemary to a martini shaker. Muddle it well. 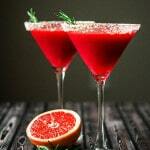 Add some ice to the martini shaker and then the grapefruit juice and ginger. Shake the mixture well and pour into two martini glasses.